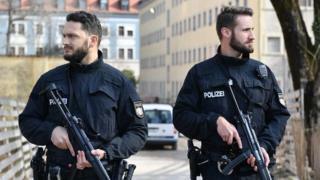 Police in Germany have arrested 10 people on suspicion of planning an Islamist attack. The men had plotted to "kill as many 'non-believers' as possible" using a vehicle and guns, prosecutors said. The men have been detained on charges of terrorism financing and criminal conspiracy. Police seized 20,000 euros (£17,000; $22,500) in cash during the raids, as well as several knives, drugs, a number of electronic devices and documents. The most deadly was in December 2016 when a man drove a lorry into a crowded Christmas market in Berlin, killing 12 people. Anis Amri, the Tunisian behind the attack, was shot and killed in Italy four days later.